Hi, friends. It is merely mid-September and so most of you, if not all of you, have no interest in a State of the Oscar Race missive. The Academy Awards, after all, are but a faraway Alpha Centauri-ish glimmer in the sky, and so there are still hundreds, if not thousands, of films striving for critical and peer praise that have yet to be released. But there have been significant developments in the last couple weeks. “A Star Is Born”, Bradley Cooper’s directorial debut and remake, of sorts, of the 1978 movie which was a remake, of sorts, of the 1954 movie which was a remake, of sorts, of the 1937 movie which was a remake, of sorts, of 1932’s “What Price Hollywood?” screened at the Venice Film Festival and then at the Toronto International Film Festival and was met with critical rapture, believe the hype tweets, and standing ovations. “A Star Is Born Looks Like An Oscar Contender”, brayed The Atlantic. “Oscar Voters Are Sure to Go Gaga for Bradley Cooper’s ‘A Star Is Born,’”, declared Variety in what sounds like a headline straight outta Tronc-approved journalism school. The latter is what interests us. Is it true? Might one Stefani Joanne Angelina Germanotta earn an Oscar nomination? We are not here to say yay or nay. And we are definitely not here to say whether or not she will win if she is nominated. No, Cinema Romantico is merely here to prepare you for the possibility that Lady Gaga will be nominated for an Oscar. What, you might be wondering, will the pop culture landscape look like in the wake of such an event? Awards Backlashologists are already predicting the adverse response might be beyond the the damage assessment measuring capabilities of The Hathaway Scale. However, this blog is in a unique position to answer the most pertinent questions in the face of this suddenly very real possibility – that position being a person with a picture of Lady Gaga and Bruce Springsteen stuck to his refrigerator (which his Beautiful, Perspicacious Wife lovingly tolerates). We feel like any worries you might have should the name Lady Gaga be called the morning of January 22, 2019 are worries we can talk you through. You Are Worried That….. Lady Gaga Will Wear A Meat Dress To The Oscars. Hey, you’ve lived through Barbra’s mauve cape, and Bjork’s swan, and Juliette Binoche draping herself in velvet, okay, so you’ll be fine wehther Gaga quotes Mitzi Del Bra, or shows up in a Gaultier sack-back gown, or, evoking her 60 Minutes interview, shows up sans makeup and drinking whiskey. You Are Worried That..... Lady Gaga Will Make Some Sort Of Overdramatic Entrance. This is a problem? Give me a choice of Jimmy Kimmel dropping candy from the sky for the third straight Oscars or Gaga channeling her Venice entrance where she perched on the edge of a taxi boat wearing black stilettos and blowing kisses, her hair up in victory rolls like she was Betty Grable on her way to the premiere of “Song of the Islands”, and I’m taking the latter in a heartbeat. I hope she shows up to the Oscars riding a giant mechanical dragon puppet breathing foam fire. Try and ask the dragon a question before it eats you, Seacrest. You Are Worried That….. Lady Gaga’s Acceptance Speech Would Be Over-Earnest, Cringe-Worthy Dreck. I was at Lollapalooza 2010 when Ms. Gaga had but one and a half albums at her disposal was forced to significantly banter between songs to fill time, though her banter was less Neko Case-y comical than counting her blessings, over and over, which struggled to blend with declarations of taking a ride on other people’s disco sticks, and such. It didn’t really work, even for me, person with Lady Gaga on his refrigerator, and I can only assume if she did somehow win the Oscar that her speech would last way too long and get way too emotional. She already went Sally Field at TIFF. But Sally Field went Sally Field at the Oscars and the world’s still turning. You Are Worried That..... Lady Gaga’s Oscar Nomination Will Complete Her Mainstream Ascension. Ah, I see you original Gaga fan! You, Little Monster, before Little Monsters became as trendy as Hufflepuffs. And you should know better than anyone that Gaga is neither Mainstream nor Punk Rock; she is Artpop. An Oscar nomination will merely make her more powerful. You Are Worried That..... Lady Gaga’s Oscar Nomination Would Inevitably Lead To A Lady Gaga Jukebox Musical. Too late! I am already shopping my “Highway Unicorn” script around Hollywood! You Are Worried That….. Lady Gaga Will Get An Oscar Nominaton Before Kirsten Dunst. This is a very real fear, and it is a very real fear that I understand. I am, after all, a Dunst Completist, a Kiki Enthusiast. That she has not received an Oscar nomination is a literal crime in the kangaroo court of Hollywood. And yet, if in the wake of a Gaga Oscar nod I was called to testify on behalf of Ms. Dunst, given my long-standing love of her acting and steadfast belief she gave the best performance of 1998, I would raise my right hand, swear to tell the truth, the whole truth, and nothing but the truth, and then tell everyone clamoring for Stefani’s head, in my official capacity as a Dunst Devotee, to just, like, chill out, okay? You Are Worried That...... Lady Gaga Can’t Act. That’s probably only because you think Lady Gaga can’t sing. You Are Worried That….. Lady Gaga’s Nomination Will Push Out A More Deserving Performance. For the love of god, this happens every year. Remember when Cinema Romantico was convinced two years ago that it was Annette Bening’s “time”? You Are Worried That….. It’s Supposed To Be Glenn Close’s “Time”. If it’s her “time”, it will be. A Gaga nod will not impede Close. It’s not Gaga’s “time”; it’s Gaga Time. It’s always Gaga Time, at least in Little Monster Land, perched beneath the big rainbow between Mountain and Pacific. 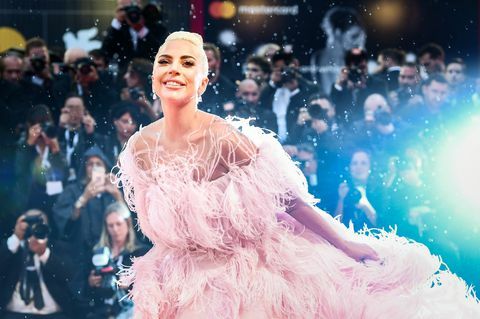 And if she gets that Oscar nod, whether you like it or not, all time in the United States, from coast to coast, will be governed according to Gaga too.